The Milwaukee area chapters of Wild Ones are again offering a variety of seminars at Cardinal Stritch University. NATIVE PLANT COMMUNITIES: FUTURE LANDSCAPES OF NECESSITY — Neil Diboll will discuss how native landscapes provide beauty, wildlife habitat, water conservation, carbon sequestration, and energy and cost savings. He will also present alternative lawns that require little or no fertilizers or pesticides. LESSONS LEARNED — Brian Russart: Creating and maintaining natural areas in our parks. Tips and techniques learned while restoring natural areas in the Milwaukee County Parks will be discussed and applied to home landscaping projects. HOW TO NATURALLY LANDSCAPE & PLEASE YOUR NEIGHBORS & VILLAGE OFFICIALS, ALL AT THE SAME TIME — Bret Rappaport: A presentation on municipal ordinances with a historical perspective on difficulties encountered by native plant landscapers and suggestions for dealing with municipalities. CREAM OF THE CROP — Michael D. Yanny: A description of twenty “must have” trees and shrubs for use in home landscapes. The unique and interesting features that set these species apart will be explored as well as some propagation techniques. COOL ROOFS — Patricia K. Armstrong: A green roof collects rain water, cools the roof, waters the plants and greatly reduces the volume of stormwater entering sewers. It is also a home for insects, birds and mammals. FUTURE FORESTS — Terry Marvel: Creating and managing woodlands at home, schools and work places—combining art and ecology. 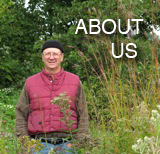 WILDFLOWER WONDERS — John Stiefel: Building an energy-efficient, totally off-the-grid house, recycling water from a pond and creating a property filled with hundreds of species of native plants to sustain wildlife including federally endangered species of insects. Yard tours are offered for Sunday, Oct. 24. 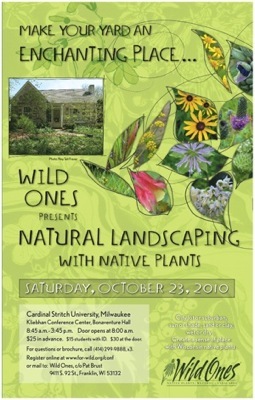 To learn about all native plant-related conferences visit for-wild.org/conf. For answers to specific questions about the October event, call (414) 299-9888, x3. The Green Bay Chapter of Wild Ones – Native Plants, Natural Landscapes has awarded a prize of a landscape makeover for a De Pere woman who described her front yard as “desperate.” Most of the plants were donated by area Wild Ones members. Read more here. 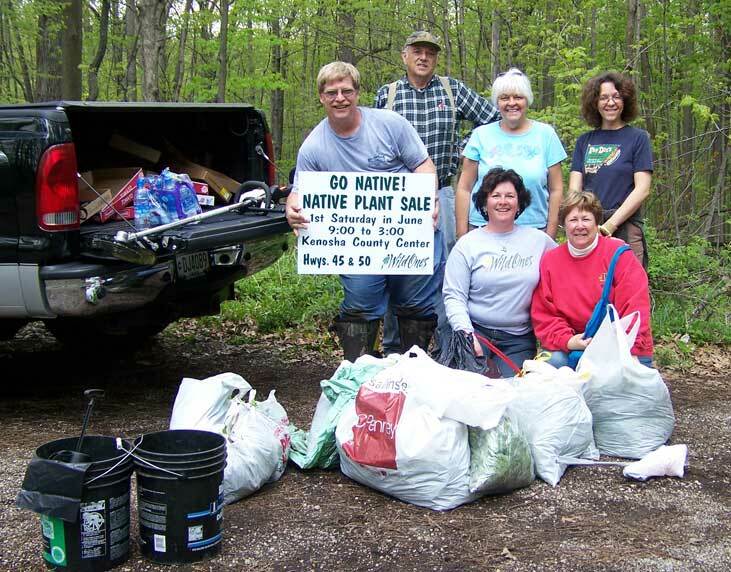 Like other good-hearted, green people across our nation, members of Wild Ones are weeding out invasives and offering opportunities for homeowners to buy native plants. Seldom, however, are both activities represented in one photo as seen in this shot from the Root River Chapter in southern Wisconsin. The scene is one of many published by the Racine Post. Read more here. Wild Ones: Native Plants, Natural Landscapes is offering a bonus for joining (or renewing at a higher level) during 2010 — your choice of the updated video Wild About Wildflowers (now on DVD) or a commemorative book celebrating Wild Ones’ first 25 years. Renew at the highest level and receive both. Basic membership is just $30/year. 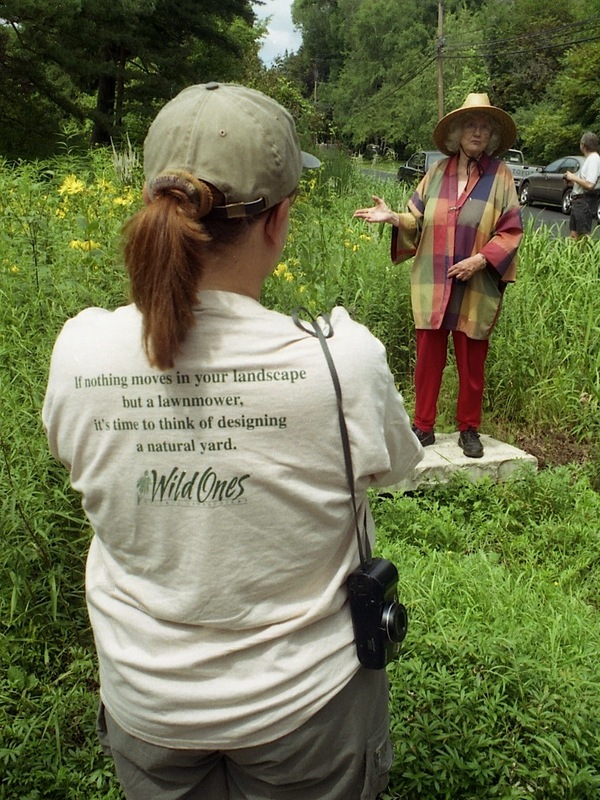 With more than 50 chapters across the U.S., Wild Ones provides educational experiences by hosting guest speakers and tours of natural areas and native plant landscapes around homes, schools, and businesses. A New Member Handbook and newsletter also come with membership. No chapter in your area? You could start one. Exciting notion — yes? Read more here.